Construction, facilities management and project investment business GRAHAM has been named as a global leader in health and wellbeing thanks to its innovative CONNECT PLUS initiative. 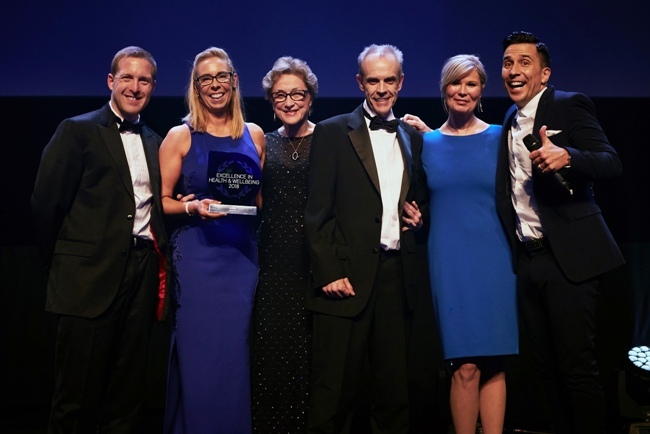 The firm, which expanded into Leeds in 2017, picked up the inaugural Excellence in Health and Wellbeing Award at the Investors In People Awards. The prestigious international award encompasses all sectors. It was awarded to GRAHAM for its CONNECT PLUS initiative, which has helped the firm decrease absenteeism 100 per cent. Absenteeism at GRAHAM is now 400 per cent below the industry average. The initiative has also boosted staff engagement by 20 per cent, with staff turnover falling to 33 per cent below the industry average. Paul Devoy, head of Investors in People, said: “This year’s Investors in People Awards were an inspirational celebration of best practice across our international community. It was fantastic to see so many worthy organisations nominated for outperformance in their approach to people management. As part of the CONNECT PLUS initiative, employees were given the opportunity to complete personality profiles. Managers then received training on how to understand different personality types, as well as emotional intelligence and mindfulness. Staff were also given the opportunity to develop their own diagnostics for health and well-being and create an action plan with a wellbeing expert to tackle confidential issues relating to nutrition and mental health. Michael Smyth, HR director, GRAHAM, said: “We are absolutely delighted that the judging panel, which included Dame Carol Black, who was the government’s Head of Health and Wellbeing Strategy from 2006 to 2016, recognised GRAHAM’s approach to health and wellbeing as highly innovative and leading the way in the UK. “This is an outstanding achievement and it is a reflection of our ongoing commitment to making GRAHAM a great place to work where individuals can attain their personal and career goals. “Good wellbeing is good business and our commitment to driving excellence in people management led to the development of GRAHAM’s employee health and wellbeing initiative, CONNECT PLUS – a visionary approach to whole person development. Congratulating GRAHAM on its commitment to health and wellbeing, Dame Carol Black, who sat on the judging panel for the IIP Excellence in Health and Wellbeing Award, said: “GRAHAM has demonstrated a strong comprehensive commitment to the health and wellbeing and engagement of its workforce. “It is evident that this organisation has taken on the challenges of employee health and wellbeing, drawing in leadership and engagement from a senior level through to individuals, answering them with a comprehensive programme of policies and actions designed to promote, safeguard and improve health and wellbeing. Investors In People is the international standard for people management and enables organisations to benchmark against the best in the business on an international scale. Last year GRAHAM was awarded Investors In People Platinum accreditation, the highest accolade that can be achieved against the Investors in People Standard and is currently held by only three per cent of Investors In People accredited organisations. GRAHAM also achieved the Investors In People Wellbeing standard, the first company to achieve both accolades at the same time. The firm is currently completing over 100 live projects across a range of key sectors including education, healthcare, commercial, retail, highways and rail.